Coaches never really know what to expect when their team returns to action after the April break. The hope is that their athletes squeezed in some training while on the beach or camping in the desert and then when they return to practice, can return to form both mentally and physically. The turnaround was especially daunting for the Crested Butte Titans girls’ soccer team as they had just one practice after the break before lining up to face the Ridgway Demons on Tuesday, April 19. All joking aside, Kidd was impressed with what she saw out of her team on Tuesday. “It was great to see them come together after Spring Break and play the best they’ve played all season,” says Kidd. The Titans were noticeably flat in the opening minutes of the game as the Demons pressed hard, pinning the Titans in their own half of the field. But the defense has been the strongpoint of the Titans team and they held off the initial assault allowing the rest of the team to get their feet under them and get their heads off the beach and onto the field. “I think they just didn’t have time to organize but Sarah Johnson is an excellent general back there and started telling players where they needed to be,” explains Kidd. Things turned around for the Titans midway through the first half and they started connecting out of the back line, through the midfield and creating opportunities up top. Both Tess Fenerty and Siena Truex were on the receiving end of great passes into Ridgway’s 18-yard box but their shots missed the mark and the two teams closed out the first half in a 0-0 tie. Halftime gave the Titan coaches an opportunity to rehash what the team had been focusing on during practices. 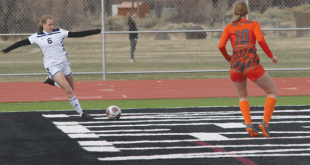 The Titans also had the advantage of playing with the wind at their backs in the second half and talk of pressing harder and the help of the wind paid off 10 minutes into the second half. Rachel Potoker pulled in another save in net for the Titans and sent a quick punt down the field that bounced over Ridgway’s center back. Fenerty seized on the opportunity to chase the ball down and slip it into the far corner past the Ridgway keeper for a 1-0 Crested Butte lead. Things started to disintegrate for the Titans midway into the second half and Ridgway came close to equalizing on a couple of occasions but the Titans shifted back into overdrive sparked by the work of Ella Lapello, Murphy Sloan and Ryan Carroll on offense. Heavy pressure on the Ridgway defense and hustle to 50/50 balls kept the ball alive in the Demon end and it paid off as Fenerty seized on another chance to beat the Demon keeper for a 2-0 Titan lead. 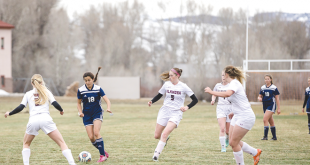 The Crested Butte defense held tight and the midfield broke up several Ridgway possessions in the middle of the field to hold on and seal the 2-0 shut out win. 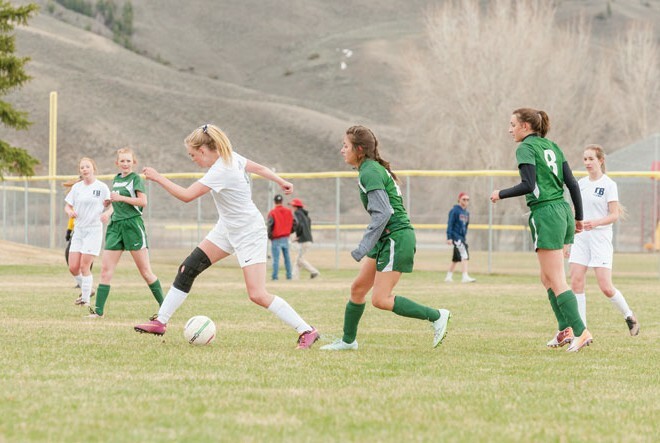 The Titans return to workouts the rest of this week and then host Montrose on Tuesday, April 26 at 3:30 and 5 p.m. in Gunnison at Jorgenson Field.